This is SLIG week for The Legal Genealogist — the the 2016 Salt Lake Institute of Genealogy is now starting its third day at the Salt Lake Hilton, and everyone is having a ball. More than 360 students in a dozen classes learning about everything from law to DNA to research in different locations like New York or the south to church records and genealogical writing. How much better does it get than that? Yesterday was a terrific second day. In my new course, Corpus Juris: Advanced Legal Concepts for Genealogists, the students got a field trip to the University of Utah under the expert guidance of law librarian Lee Warthen — and most came away with confidence that they could use the law library records in the future. Today, we’re on into family law and some hands on exercises with records and statutory materials. And this all makes for very little time for writing. So this week is the word-of-the-day week, and today’s word is a little different. It’s nominate. As in: your genealogical or historical society can nominate a candidate for the National Genealogical Society’s Donald Lines Jacobus award. The deadline is January 31. Since 1986 when Donald Lines Jacobus became the first genealogist elected to the National Genealogy Hall of Fame, thirty outstanding genealogists have been recognized for their contributions to their local, state or national societies, or simply to the greater genealogical community. The 2016 honoree will join this select group of distinguished members, and the winner, and the society that honored the nominee, will be announced in May at the NGS 2016 Family History Conference in Fort Lauderdale, Florida. This is an opportunity for your society to honor a genealogist whose efforts or legacy projects have helped genealogists today. Perhaps there was a notable genealogist in your state or county whose name should be memorialized in the National Genealogy Hall of Fame. If your society’s nomination is the winner, your nominee will receive national exposure for their contributions to the field. A nominee must have been actively engaged in genealogy in the United States for at least ten years, been deceased for at least five years at the time of nomination, and made contributions to the field of genealogy judged to be of lasting significance in ways that were unique, pioneering, or exemplary. Nominations for election to the National Genealogy Hall of Fame are due by 31 January 2016. Official nomination forms are available from our website, www.ngsgenealogy.org, Awards & Competitions, or by contacting the National Genealogical Society, 3108 Columbia Pike, Suite 300, Arlington, VA 22204-4304; phone 1-800-473-0060. Think about it. 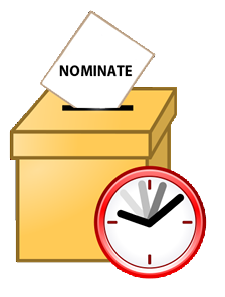 And if your genealogical or historical society knows of a worthy candidate, well, the word of the day is… nominate.